Ammunition: .22 Long Rifle rimfire, .223, .30-06, and .375 Holland & Holland cartridges, and 12, 20, and 28 gauge shotgun shells. Ammunition, often referred to as ammo, is a generic term meaning the assembled set of components that makes up whatever is to be fired from a firearm. Usually this includes a bullet or shot charge, the gunpowder that serves as the propellant, the percussion cap that when struck by the firing pin of the gun ignites the powder, and the casing or shell into which those components are assembled. Blank ammunition—without a bullet or shot—is an exception, as is very low power ammunition for special purposes that has no gunpowder, but relies solely on the energy provided by the percussion cap. For rimfire ammunition, the percussion cap is not a special part, but is made inside the rim of the case. With muzzle loading guns and some large military guns, there is no casing holding together the components of the ammunition fired in them. With shotgun ammunition, there is also a wad or series of wads separating the powder from the shot. The term "ammunition" is also frequently used for whatever will serve as the projectile or what is delivered to the opponent in any situation of combat or quasi-combat. Thus, snowballs may be called ammunition in a snowball fight and plastic balls of paint may be referred to as ammunition in a paint-ball contest. Even the arguments of a lawyer or legal team, or the arguments of a philosopher, or the reasons offered by a religious figure, may be called ammunition in an exchange or contest of ideas. The term "ammunition" is derived through French from the Latin munire (to provide). Cartridge refers to ammunition assembled into a single loaded ensemble packed into a metallic casing, such as is fired from rifles, handguns, and machine guns (collectively known as small arms). Such cartridges are called small arms ammunition (SAA). Shot consists of a number of small projectiles, usually spherical and made of metal such as lead, intended to be fired all at once in a single discharge; these are known as shotgun shells or shotshells, and are not properly called cartridges. Except in the rarest of instances, the housing of a shotgun shell is not a metal casing, but is a plastic or paper hull, usually with a metal base. But cartridges loaded with shot are available for use in handguns, .22 rimfire guns, and possibly some others. A round is a single unit of ammunition; for a modern small arms cartridge this is the combination of bullet, propellant, primer, and cartridge case in a single unit; a round could also be one shotgun shell. Large-caliber military guns often fire explosive-filled projectiles known as shells. This kind of explosive shell must be distinguished from a shotgun shell; shotgun shells do not have explosive-filled projectiles. The Geneva Accords prohibit military use of softpoint (left) and hollowpoint (right) ammunition. The design of ammunition is determined by its purpose. For sporting use, rifle ammunition may be designed for maximum accuracy, for maximum penetration on very large animals, for rapid expansion on smaller animals, and for other purposes. Some ammunition is designed to be inexpensive; in other instances the design will be more expensive but the purchaser will be willing to pay more because the product better suits his purposes. Some ammunition for handguns is designed to make a sharp hole in a paper target and is loaded with wadcutter bullets. Ammunition for military purposes must, by the Geneva Accords, be loaded with full metal jacket bullets. Anti-personnel military ammunition is often designed to break up or tumble inside the target, in order to maximize the damage done. Some military shells contain shrapnel and are designed to explode in mid-air, so its fragments will spread over a large area. Armor-piercing ammunition tends to be hard, sharp, and narrow, often with lubrication. Incendiary projectiles include a material such as white phosphorus, which burns fiercely. Tracer ammunition emits light as it travels, allowing the gunner to see the path of bullets in flight while using a machine gun. Some ammunition for police and crowd control use is loaded with rubber bullets or other projectiles intended to be non-lethal. Ammunition, particularly for small arms, is specified by an extremely wide range of designations derived from metric and English measurements, commercial firms' private systems, and other conventions. American and British usage tends to express measurements and ammunition designations in inches and thousandths of an inch, and weight of projectiles or shot in ounces or grains (1/7000th of an avoirdupois pound), while the rest of the world tends to use metric designations: Millimeters, centimeters, and grams. The diameter of shotgun shells is universally expressed throughout the world in gauge (12 gauge being by far the most common; other common gauges are 10, 16, 20, and 28) with the exception of the .410, which is the actual diameter expressed in thousandths of an inch. The length of shotgun shells is given in inches in the United States and parts of the British Commonwealth; elsewhere in the world it is usually given in metric units. Some ammunition is designated match or match-grade. This is usually of exceptional quality and consistency, intended for target-shooting competition. Ammunition for center fire rifles is usually packaged and sold in boxes of 20 rounds. Ammunition for shotguns is usually packaged and sold in boxes of 25 rounds. Ammunition for handguns, some small center fire rifles (e.g. .22 Hornet, .223, etc. ), rimfire rifles, and pistols is usually packaged and sold in boxes of 50 rounds. Boxes of 25 each of 12, 20, and 28 gauge shotgun shells, and a box of 50 .22 Rimfire Long Rifle target cartridges. There are some exceptions to those general rules: Shotgun slugs are frequently sold in boxes of five; .22 rimfire ammunition is sometimes packaged and sold in boxes of 100 rounds; very expensive ammunition for large center fire rifles (e.g. the .600 or .700 Nitro Express) is usually sold in boxes of fewer than 20 rounds. Other exceptions also exist. In addition to those basic packaging conventions, cartons of ten boxes of 50 rounds of .22 rimfire ammunition (for a total of 500 rounds) are frequently sold; these are often called bricks because of their weight and their rough approximation to the size of a building brick. Cartons of ten boxes of 25 shotgun shells (for a total of 250 rounds) are also common. Ammunition for military rifles is frequently packaged in metal canisters holding more than a hundred rounds. In addition, ammunition intended for some military weapons that utilize a clip—such as the American M 1 Garand, or the WWII era Italian 7.35 mm Carcano—is often already put into the appropriate clip, so that all the user has to do is insert a new, already-loaded clip of ammunition into the weapon. 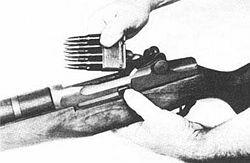 Such weapons are often made so that the old clip will fall out of the gun and drop to the ground after the last round in the clip is loaded or fired. Military ammunition includes everything from ammunition for handguns and small arms, ammunition for machine guns, shells for tube artillery and mortars, and even aircraft-delivered bombs, smart bombs, rockets, and other explosive-bearing projectiles. The destructive power and lethality of these systems is very great. A single cluster bomb, deliverable by any of the above systems, can sow grenade-sized bomblets across a 100 yard (90 m) football-sized field in sufficient density to kill any persons present, even in trenches and wearing body armor. Ammunition for infantry refers to the ammunition carried by a typical foot (infantry) soldier. Someone serving in the infantry generally carries, in pouches, bandoliers, and other containers about 100 rounds of small-arms ammunition. It is usual to supplement this, when an action is imminent, from the regimental reserve. Every successive improvement in military arms has led to a corresponding modification in the method of supplying ammunition and in the quantity required. When hand-to-hand weapons were the principal implements of battle, there was no such need. But in the Middle Ages, the archers and crossbowmen had to replenish the shafts and bolts expended in action; and during a siege, stone bullets of great size, as well as heavy arrows, were freely used. The missiles of those days were, however, often interchangeable. For example, at the Battle of Towton (1461), part of the War of the Roses, the commander of the Yorkist archers induced the enemy to fire arrows in order to obtain them for firing back. This interchangeability of war material was even possible for many centuries after the invention of firearms. At the Battle of Liegnitz (1760), a general officer was specially commissioned by Frederick the Great to pack up and send away, for Prussian use, all the muskets and ammunition left on the field of battle by the defeated Austrians. Captured material is still sometimes utilized by the other side. It is rare to find a modern army that uses a high percentage of captured ammunition, although many terrorist and irregular forces often do rely on this. Owing to the rapidity with which ammunition is expended in modern warfare and the fact that, frequently, more shots have to be fired in order to inflict heavy losses, it is necessary that the reserves of ammunition should be as close as possible to the troops who have to use them. With the older larger-caliber firearms, because of the great weight of the ammunition, the soldier could only carry a few rounds. Today, with the adoption of smaller caliber weapons, soldiers are able to carry more rounds. Still, the supply of ammunition to soldiers is critical, and military forces must carefully organize and supply ammunition supply systems. Every reduction in the caliber (size) of the rifle's ammunition means an increase in the number of rounds that a soldier can and does carry. One hundred rounds of the British Martini-Henry ammunition of pre-World War I era, for example, weighed 10 pounds 10 ounces (4.8 kg); the same weight gives 155 rounds of .303 British ammo (the standard British service caliber of WWI and WWII), and a still greater number of rounds of today's 5.56 NATO ammo. In western (NATO) forces, the 7.62 mm NATO round has been mostly replaced by the lighter 5.56 mm NATO round. The larger caliber ammunition is still retained where range and weight of shot is important, such as in machine guns and sniper rifles. Other nations, especially forces with former ties to the Soviet Union tend to use rifles related to or developed from the AK-47, with similar sized rounds to the NATO ones. They use [[7.62x39 mm] and 5.45x39 mm for assault rifles and 7.62x54R for sniper rifles and light machine guns. The adoption of the tank by armies made horse mounted cavalry obsolete, and new weapons were needed to damage a tank or other vehicle, or penetrate and wound the crew. The bazooka was introduced for this purpose. The introduction of the shaped charge warhead gave the infantry a weapon that used chemical energy rather than kinetic to beat the armor in a focused way which made them more effective than large grenades. When propelled by a rocket, the shaped charge gained range as well. After World War II, the advent of the missile delivered both great range and accuracy and provided infantry with a weapon that could reliably destroy the heaviest tanks at long distances. Weapons developed primarily for anti-tank roles can add proximity fusing to increase the probability of a kill by having the warhead detonate nearby the target without having to make contact. Aircraft are relatively delicate machines, filled with highly flammable fuel, and since their first usage in World War I, a plane can be brought down by a single bullet striking something vital. 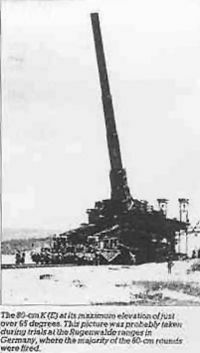 This led to the development of anti-aircraft guns, with their accompanying ammunition. The main weaknesses of such guns and ammunition provided to infantry, for aircraft attack, are their limited range and small warheads. Today's infantry is often provided with shoulder-fired heat seeking missiles, known as SAMs, such as the Stinger. Numerous other missiles in this class exist from different nations of origin. 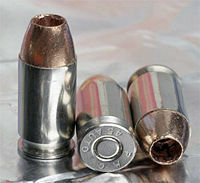 Above a certain size, semi-fixed rounds (or cartridges) are impractical; the weight of the whole assembly is too much to be carried effectively. In this case, separate loading ammunition is used: The projectile and propelling charge are supplied and loaded separately. The projectile is rammed home in the chamber, the powder charge(s) are loaded (often by hand), then the breech is closed and the primer is inserted into the primer holder on the back the breech. This is true for both large naval guns and for land-based guns. In order to supply the ammunition sufficiently rapidly for the efficient service of such guns, hydraulic, electric, or hand-power, hoists are employed to raise the powder bags and shell from the storage area to the gun floor, whence they are transferred to a derrick or loading tray attached to the mounting for loading the gun. The projectiles for such large guns arrive at the weapon with a dummy-plug in the fuse hole on the nose of the projectile. Using a special fuse wrench, the plug is unscrewed and a fuse is screwed in. Common artillery fuses include point detonating, delay, time, and proximity (variable time). Point detonating fuses detonate upon contact with the ground. Delay fuses are designed to penetrate a short distance before detonating. Time fuses, as the name implies, detonate a certain time after being fired in order to achieve an air burst above the target. Time fuses are set to the tenth of a second. Proximity or variable time fuses contain a simple radio transceiver activated at a set time after firing to detonate the projectile when the signal reflected from the ground reaches a certain strength. Fuses are armed by the rotation of the projectile imparted by the rifling in the tube, and usually arm after a few hundred rotations. 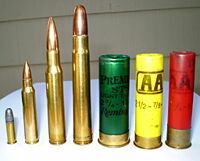 Ammunition for both civilian and military use can be stored for relatively long periods of time—several decades certainly, and possibly as much as a half century or even more—with no substantial deterioration in quality provided it is kept relatively cool and protected from chemicals that would attack and thus deteriorate the metal casings of the rounds. 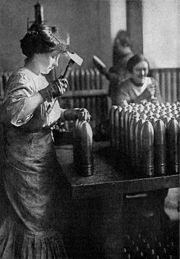 During World War II, for example, some stores of ammunition left over from World War I were put into service. Ammunition for military use is usually stored in fortresses; these are often known as "ammunition dumps" or "magazines," and are situated, as much as possible, to protect the ammunition from an enemy's fire or bombing. The various types of ammunition stored in such a magazine are usually separated into distinctive units and marked, labeled or painted in such a way that identification of the size and type of ammunition is easily made. The number and nature of rounds allotted to any fortress depends on questions of policy and location, the degrees of resistance, the nature of the works and personnel, and finally on the nature of the armament. That is to say, for guns of large caliber three hundred to four hundred rounds per gun might be sufficient, while for lighter guns it might amount to one thousand or more rounds per gun. CIA Ammunition & Explosives Supply Catalog. Boulder, Co.: Paladin Press, 1974. Freeman, William K. Jr. Study of Ammunition Consumption. Master of Military Art and Science (MMAS) Thesis. U.S. Army Command and General Staff College, 2006. Lewis, Berkeley R. Notes on Ammunition of the American Civil War, 1861-1865. American Ordnance Association, 1959. United States, General Accounting Office. Ammunition Industrial Base [Microform]: Information on DOD’s Assessment of Requirements: Report to Congressional Requesters/United States General Accounting Office. Washington, D.C.: The Office. This page was last modified on 15 March 2016, at 16:18.